We're starting of with this lovely entry from DIY Network in which a rather roomy dresser was turned into the perfect spot for poochie. Click here to read how it was accomplished. 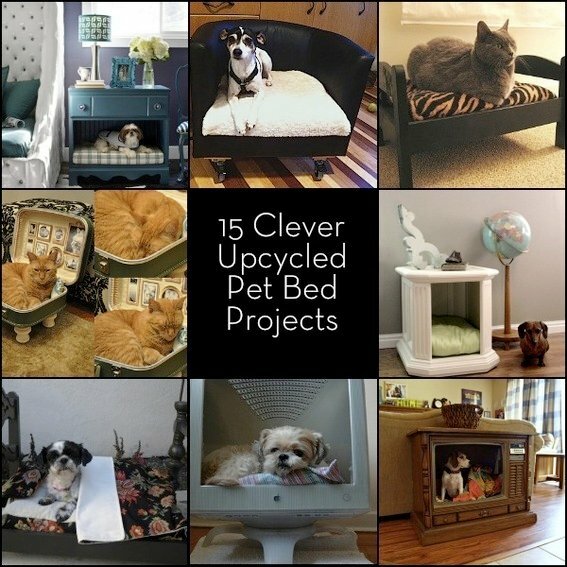 Jorden turned a second-hand night stand into this snuggly pet bed. Another side table, this time an awkward one, is a perfect place for Mr. Wiener to crash. Still one of my favorites, an end table turned upside down kitty four poster. Mee-yow. Tube tvs as doggie beds? Heck yeah. This one certainly is colorful. And for the purist...look...Mr. Sniffers is on TV! These two beds were made out of a drawer (the one on the left) and an old chair, (on right). And another chair-turned-bed. This time complete with bedding. Now for a couple of IKEA hacks. This one is a simple DUKIG Doll's Bed that's now the perfect spot for Ms. Whiskers. DeAnna scored a SOLSTA OLARP and A POANG footstool cushion in the AS-IS department for about $45. She attached four large IKEA wheels now her fur-child has a chair/bed of his own. Okay, these last four didn't start out as furniture, but they deserved a spot on our roundup. The first is this home-sweet-home suitcase turned kitty bed. That gallery 'wall' for the cat kills me! And for the minimalist, no frilly stuff. Just a comfy pillow. Just wanted to stop by to tell you how much I loved the dog beds - we featured you this morning on www.theupcycleblog.com. So many great ideas - thanks for the inspiration! This is giving me big ideas!! !